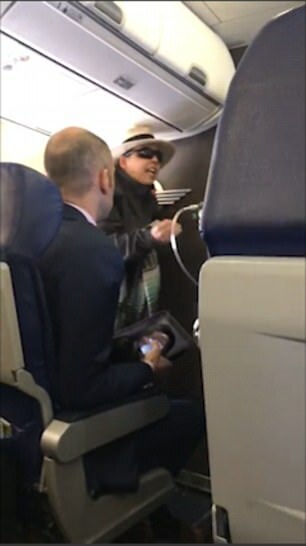 The woman, 24-year-old Valerie Curbello, who lives in Sandy, was restrained by passengers and the flight crew before being escorted off the plane and arrested upon landing. Our Crew in command of Flight 2943 traveling from Portland on Saturday afternoon safely landed on-time in Sacramento following an inflight disturbance. Our reports from Flight Attendants indicate a Customer violated federal laws by both smoking onboard an aircraft and by tampering with a smoke detector in an aircraft restroom. Our Crew enforced the regulation and that was followed by the passenger outburst. The safety of our Crew and Passengers is our top priority and we take all threats seriously. The Pilots declared an emergency to receive priority handling from air traffic controllers, and our Crew handled the situation onboard until the plane landed and local authorities stepped in. The flight carried 136 Customers and a Crew of five. Curbello told a Sacramento CBS affiliate reporter she was trying to smoke because she was having anxiety. “It was not me, it was not me,” Curbello told the reporter. A friend of Curbello’s told KOIN 6 News she took Curbello to a mental health crisis center just days before the incident on the plane. She was worried about Cubello and doesn’t know why she went to Sacramento. She is being held in a Sacramento jail on $75,000 bail.